To view Sundowner Trailers manufacturer website - click here. The all new Sportman is an all aluminum trailer that is built with today's budget conscious buyers in mind. It is a slant load bumper pull trailer that is available in a 2 horse or a 3 horse. It has drop down feed doors on the head side and is fully enclosed with a huge 18" x 64" window that drops down on the rump side for increased air flow. This trailer also has a tack room with a swing out saddle rack. The Sportman is built with the same quality and standards that people have come to expect from Sundowner. It carries a 3 year hitch to bumper and 8 year structural warranty. This trailer is perfect for hauling with smaller tow vehicles. 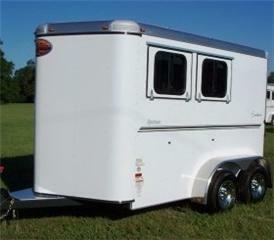 All aluminum 2 horse slant load, fully enclosed, 6'9" x 7', LED lights, rubber torsion Dexter axles, 4 wheel electric brakes, 15" tires, 2 5/16" coupler, Sundowner built doors, slant wall with double wall construction -- lower half, all walls in horse area Suncoated and double wall construction, front tack storage room with swing-out saddle rack, bridle hooks, blanket bar, brush tray, floor mats, solid head/shoulder divider, recessed roof vent per horse, drop-down head door with window per horse -- for extra ventilation, 64" drop-down rump window with bars - for extra ventilation, double rear doors with windows with full height cam latches, full width rubber bumper.